The 1891 census report recorded the population of North Curry as 1604, which included a school population of 140 in North Curry and 45 in Wrantage. The 1991 census showed that the population was somewhat reduced at 1,479 with a total school population of 129. In 1894 36 residents were engaged in business within the Parish and there were 36 identified farmers. The village had no Memorials in Queen Square, and it was ducks, not dogs, that fouled the village green. Following changes in agriculture and transport all four blacksmiths, five wheelwrights and two harness makers have long gone. Lost too are the five beer retailers (separate from inns), and the only public house still trading under the same name is the Bird in Hand. 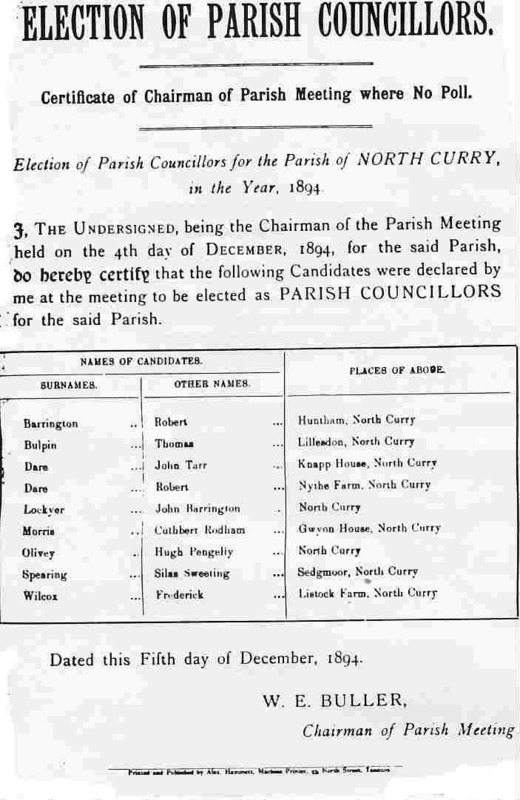 100 years ago in December 1894, the first nine-member Parish Council was elected. It consisted mainly of property owners who had previously served as members of the Vestry Meeting which supported the Parish poor. The first Chairman, who remained in office for 21 years, was Mr. C R Morris; during its 100 years, there have been 12 Chairmen to the present day. The Parish Council, as a civil body separate from the church, assumed the position of an elected representative group which the population at large could approach on any matter of concern. Elections for the Parish Council took place as part of the Annual Parish Meeting. The latter were generally well attended, 60-90 people, and the nine seats were regularly contested. The most intriguing election took place in 1928. The APM Minutes clearly record the procedure. Twelve people stood for the nine seats and votes were cast for each candidate in alphabetical order by a show of hands. There came a problem when the tellers reported eight clear decisions but a tie for the ninth seat. Without further ado, the Chairman of the meeting, Col. Barrett, exercised his casting vote by tossing a coin to make his selection. This was obviously thought to be fair because no repeat poll was recorded. A nine-member Council continued in being for 52 years until 1946 when, by order of the County Council, the election at the Annual Parish Meeting returned a new 13 member Council, most of whom were farmers. Thereafter elections took place every four years by secret ballot. The overt showing of hands was gone and with it the influence of others present. But was this a totally beneficial thing to happen? Despite the control candidates may have had over voters through employment and property ownership at least the nominee was known to the electors, whereas today this may not be the case. The outlook of the Parish Council, its ability to do things for the community and the effectiveness with which it reflects Parish concerns to various Authorities has seen many peaks and troughs. The nine-member Council had to deal with the business of two World Wars and various Royal happenings. The larger Council has had to deal only with the coronation of Elizabeth II in 1953 and her Silver Jubilee in 1977. It would appear that post 1946 the Parish Council has developed the role of a representative body taking up various issues with the authorities. This contrasts sharply with the earlier Council, although there is a constant underlying feeling of not pleasing all people at all times. As early as 1906, after considerable bitter argument, the Annual Parish Meeting voted not to buy and house a fire engine. This followed a suggestion of Parish Council disinterest to the point of opposition and therefore an earlier decision to buy a fire engine should be rescinded. The acrimony of the night was reflected by the final minute, ‘The Chairman remarking, ‘You have lost your fire engine” brought the meeting to a close”. In 1913 the Chairman, Mr. C R Morris, explained the new Water Supply Scheme, but things did not run smoothly. The issue of poor supply is raised on many subsequent occasions through to 1961 and finally in 1967 when new pipes laid through the village brought complaints about poor road surface in Church Road and The Fosse. Presumably, the water pressure was improved. In 1932 the Parish Council resolved to do all in its power to secure public electricity supply. 60 years later the Parish Council finds itself strongly protesting the poor continuity of supply to the now private Electricity Company. 1920 saw a special meeting convened to give consent to the Parish Council to borrow £500 from the Public Works Loan Board to purchase a five-acre field for allotments. The loan was to be repaid over 50 years by annual instalments of £35 14s.2d. By July 1947 the redemption value of the loan was £615, allotment rents raised only £16 pa., so the sale of the field to Taunton Rural District Council was considered. Fortunately for us, the proposition was voted out, 29 to 22. The same field now provides for Allotments, Playing Fields, and a new Village Hall. Two years later the APM discussed the possibility of a village playing field. A special meeting would be held but never was. Nothing further is recorded until 1965 – but nothing happened, and again in 1969. Then with a change of Chairmanship to Mrs. Rosemary Ryan, a Playing Fields Management Committee was set up, independent of the Parish Council, and the following year, 1970, the Committee Chairman reported the future work and aims. There followed in 1977 a Village Hall Management Committee similarly independent of the Parish Council. This innovative structure allowed those people with time and energy to develop the community facilities, unfettered by the Parish Council. It similarly relieved the Parish Council of onerous workload and criticism. Throughout its entire life the Morris Memorial Hall, gifted to the Parish Council in 1925 by Mr. R S Morris, was a millstone. It was costly to maintain and its users complained about hire charges. In 1952 one far-sighted Parishioner suggested a Parochial Committee would better manage it. When in 1982 the Hall Management committee had raised funds and a loan from the Parish Council to build a new Village Hall the old Memorial Hall was sold, but to this day remains a problem. Also under the Chairmanship of Mrs. Ryan, the Annual Parish Meeting in 1973 discussed the provision of housing for young working couples in the village. The concept was kept alive but without progress until 1986 when under the new Chairman, Mr. N Muers-Raby, the provision of affordable housing was put into the East Deane Local Plan. Two years later the Council surveyed the housing needs of the entire parish with a view to bringing in a housing association. After several abortive attempts, Knightstone Housing Association secured land and development consent to provide eight shared ownership homes for local people which were opened and fully occupied in May 1993. Some problems have been solved, some goals have been achieved but life continues and so do other concerns. Here are just a few unsolved problems: – bad parking in Queen Square (first raised in 1965); speeding through Wrantage (first raised in 1955); speeding on Windmill Hill (first raised 1953); development limitation (first raised 1985). The Parish Council has constantly sought to improve the living environment of parishioners by whatever means possible The challenge for the next 100 years will be to keep pace with change so as to obtain the best possible quality of life for all the inhabitants of North Curry Parish.